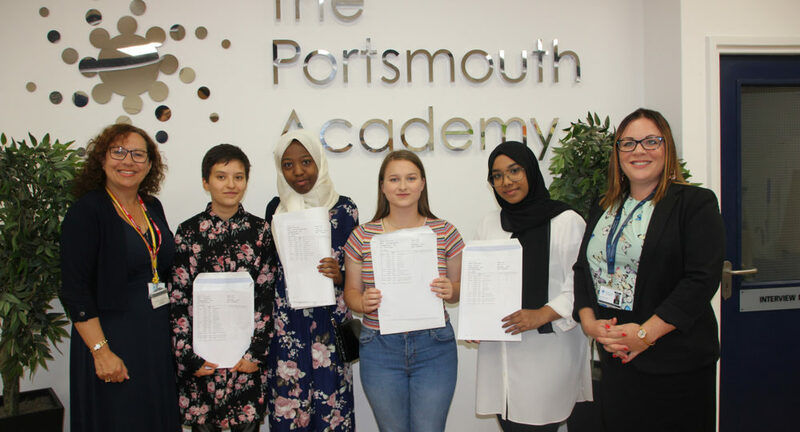 Students and staff at The Portsmouth Academy (TPA) are celebrating another fantastic set of GCSE results today. The delighted Year 11 students, more than half of whom are classed as “disadvantaged”, have achieved an average of eight GCSEs each this year – and nearly a quarter of all grades are at 7, 8 or 9, the equivalents of A* or A grades. Two-thirds of all GCSE grade were a grade 4 (a pass and equivalent to the old grade C) or better, with excellent achievement also at grade 5 or better, which is considered a strong pass. More than half of all students achieved a strong pass or better in English, Maths and Triple Science. These results have been achieved in spite of this being the first year in which all GCSEs are at a new, tougher standard, including more challenging content and questions. Significant changes to grading have been introduced, while assessment is now based on exams only, rather than coursework. There have also been additional exam papers – with some TPA students having taken as many as 28 exams. Sara Eftekhari, who is the school’s highest-attaining student – boasting an amazing 11 GCSEs, all at Grade 9 (A*). Head Girl Chloe Abraham, who achieved 10 GCSEs, of which four were the highest possible Grade 9 (A*). 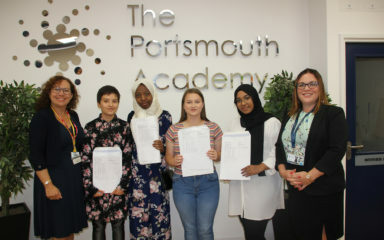 Students with English as a second or additional language, including Aiya Abdalla, who joined TPA later than some of her fellow students, and achieved 10 GCSEs including a Grade 8 in English Literature; and Naima Ali, who achieved 10 GCSEs, all at 7 or above, with five at Grade 9. Grade 9 is considered to be in the top 3-5% of students nationally. Of the Year 11 students, 28% were considered to be highly able academically. They achieved an average of 10 qualifications each and more than a quarter of their grades were an 8 or 9 (A or A*). Achievement in Modern Foreign Languages was very strong, with half of all students gaining a 7 or higher. In the Humanities, progress has been exceptional, with students significantly exceeding their targets. “We are so delighted with these wonderful exam results – which will open so many doors for our students after all their hard work. They fully deserve our praise and admiration for rising to the challenges this year’s exams brought. “I would like to thank the brilliant staff at TPA who always provide incredible support for our students.